There isn't much in the way of an abundance of flowers in February, but Donna and Sinclair were definitely up for using what was available to create their wedding flowers. I was asked to create a wild rustic bouquet in pink and whites with grey foliage. It is still one of my favourite bouquets from 2018. The wedding party flowers contained forced tulips, ranunculus and narcissus from Cornwall. Pampas grass, heather, plum blossom, dried larkspur, succulents and dried poppy seed heads. Plus eucalyptus and Brachyglottis, all from the plot. 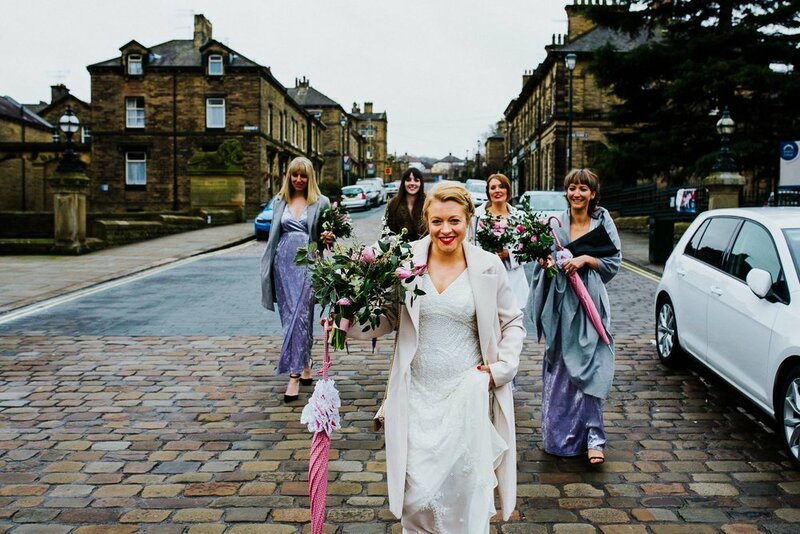 Donna and Sinclair got married in early February 2018 at Victoria Hall (www.victoriahallsaltaire.co.uk/weddings) in historic Saltaire Village.